This is a $15 dollar kijiji pick. About $11.50US. My jaw literally hit the table. Anyone on this forum that knows Canadian cans knows this is shocking. Let me retype that again, SHOCKING!!. I moved quickly to aquire it. Just for fun, someone throw up a pic of an American can of equal rarity and value to give this find proper context. Now all you need is the Canadian Heidelberg export to South Africa. Now this was much better then a great day and would have to say it was an incredible day!!!!! I had a nice dumper I put on ebay & about $15.00 was all I could get for it. What would a mint one be worth? LEON. Great Score Leo, That's a great looking can. How many cities are listed. 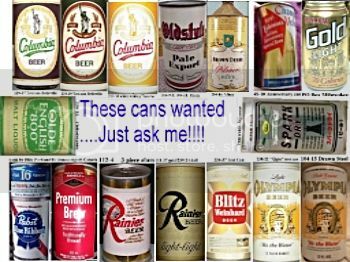 Collector of Canadian Steel Beer & Soda cans and any vintage Canadian Breweriana. It is a three city. Pictured with my five city off grade can that I think I got off of ebay about 20 years ago. I know your book has two listed but I can't remember the cities. Hey Dave, I see your book lists 4 cities CBC#20-17 and 5 cities CBC #20-17Aac. Does this mean I have found an previously unknown can?? YES The book lists a four city and a couple can company variations for the five city. We always suspected that there was a three city (to go along with the Black Label) but in all the collections that we went through doing research for the book we never found a three city. Congratulations! Congrats Leo!! An undiscovered Canadian can!! Thats great. Now that I am back in NB I will be looking for those yet to be discovered Alpine and Schooner cones lol.